Over the past six months, a new wave of activism has washed across the United States and the world, mobilizing thousands of people to camp out in city squares, protest financial institutions and disrupt meetings and conferences of the rich and powerful. The Occupy movement, as it is called, started with the Occupation of Zucotti Park in New York City and expanded to hundreds of cities in just weeks. Occupy claims to be lifting up the 99% of people who have suffered at the hands of the 1% – the richest one percent of people in the world. Now, as the movement prepares to launch huge actions in May of this year, we are reflecting on how much this movement has affected and inspired people in the neighborhoods, everyday workers, poor folks and people of color. Is this a movement with the potential to move the millions of people in this country who need systemic change? 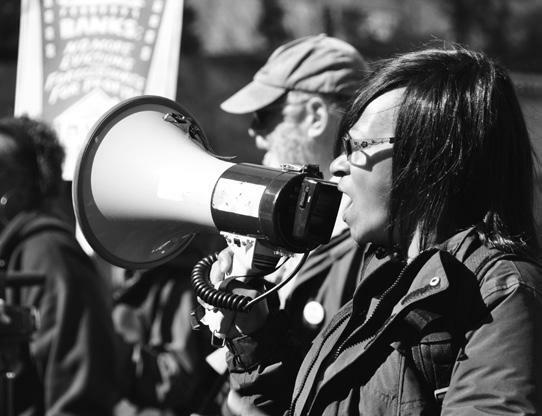 In this interview, CJJC staff member Adam Gold talks with Alma Blackwell, a leader at CJJC, who has been a part of Occupy Oakland and San Francisco actions and who has been contributing to our local housing campaign work in Oakland for the past three years. How did you first hear about the Occupy Movement and what were your first impressions? I first heard about the Occupy Movement here at CJJC. I know that the movement began with Occupy Wall Street in New York and that it was mobilizing people who were fighting back against the system. It began to spread to other cities and then the movement was here in the Bay Area, first San Francisco then Oakland. My first impressions were how amazingly the masses of people were coming together in the U.S. (and around the world) to fight against the injustices that have been plaguing our communities for so long. Also, that this is a people’s movement: working class people, people of color, poor people, oppressed people. What do your friends and family say about Occupy? Folks are feeling motivated and inspired by this movement. It’s vibrant, energetic, and creative. This movement could be bigger than the Civil Rights Movement. It’s creating solidarity among grassroots organizations who are already doing amazing work in our community. We’re in an economic crisis, people are losing their jobs, their homes, vital services are being cut, services that benefit people of color in low-income communities. People should have a right to protest without having to worry about police brutality. We should continue to target the banks and hold them accountable for the foreclosure crisis and make the big corporations pay their fare share of taxes. We are the 99%. Does the Occupy movement really represent the 99%? How could it do better? We have seen representation of the 99% at the General Strike, Nov. 2nd 2011 in Oakland. Approximately 50,000 people participated, from all walks of life. I felt proud to be a part of the history-making event. We saw students, teachers, parents, educators, health care workers, union workers, working class people, people of color, members of clergy, organizers for racial, social, political, and economic justice. So yes, I believe the Occupy movement does really represent the 99%. I do believe that as the year progresses the movement will get better. There should be a more strategic analysis of what we want to accomplish and direct action plans that do not involve destroying and defacing properties. I think there should be more occupation of properties, especially bank-owned properties. What are your hopes for the movement of the 99%? What do you think we can all accomplish together this year? I want to see the movement continue to grow stronger. This movement has created a united front for the masses of people who are and have been fighting against the evils of capitalism. We should continue to mobilize and protest against the banks and the big corporations who are profiting on the backs of the people. We know that the wealth of this country is in the hands of the 1% and this movement of the 99% is a potential to create the change this system needs.